Giihlgiigaa - Haida Weaver: How to Weave a "Spider"
How to Weave a "Spider"
Many times, when I started out weaving, was to learn how to twine. Not sure where to start, I looked for a teacher, and in 2005 I learned how to twine with cedar bark. Much later, through demonstrating my artwork, and sharing my weaving methods, the "Spider" has been a teaching aid for beginner weavers who want to learn how to make firm, durable, practical baskets. 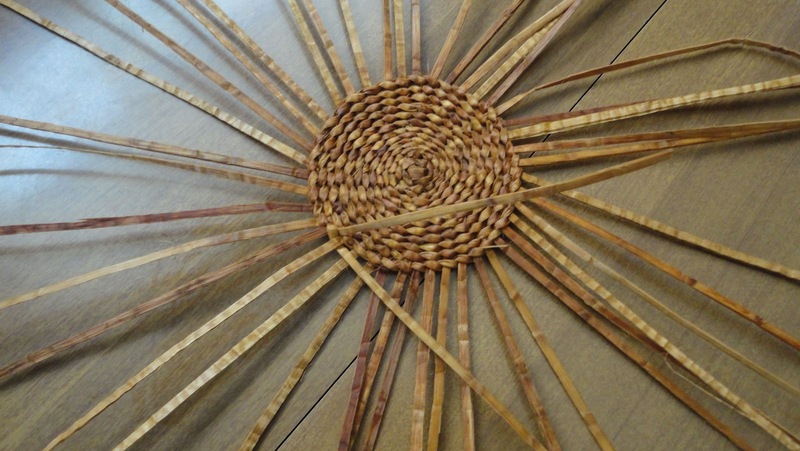 Everything you need to know about weaving or twining a basket, you learn from the "Spider." How to start the beginning weavers and warps, how to twine with two weavers, inserting new warps, and finishing the borders. I recommend making at least 30 or so of these "Spider’s" before the beginner will feel comfortable with the material, its strength, flexibility, and tension. Often the mistake is made by not using enough warps to make the work firm and durable, and unnecessarily lumpy. And a close border cannot be made in a satisfactory manner if the warps are too far apart. Start by cutting 7 or 8 pieces of either cedar bark (1/8th inch wide) or split english ivy vines. Overlay 3 warps over 4 warps. 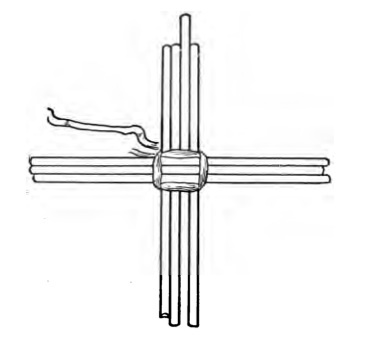 Loop your weaver or weft around the 3 warps on the left, with one weaver going under the four warps, and the other weaver going over the 4 warps. Continue with the weaver (over the 4 warps) and go under the 3 warps, with the other weaver, going over the 3 warps. Continue with the over and under to finish the row. Care must be taken that the warps are evenly separated by the time the third or fourth row is twined, so that warps come out in a straight line from the center. Beginners often find it difficult to make a basket that will stand straight and not tip to one side. No matter how careful one has been to make the bottom flat, it will bulge some in the center. 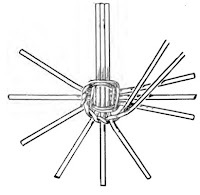 To avoid this, the weavers should not be drawn too tight, as the "spider" or basket base, must be kept flat. Weaving on a table top or cutting board and this can be easily managed. 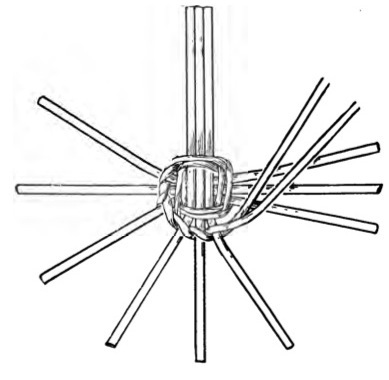 While weaving with the weaver, place the thumb on the center, and pull on weaver tight enough, but not too tight, for an even strong twine. After the second row of twining, you can start separating the warps and twine each individually. Careful to keep the warps evenly spaced. If your current row of twining has a gap from the previous row, use an awl or chop stick to press the rows together. Hold onto the warps as you do this. It will be necessary to hold down the end of one weaver, to prevent it slipping, until the other weaver is passed over it, which binds the previous weaver firmly into place. Traditionally Haida weavers start on the left and work the weavers to the right. So, your mantra for twining is: taking the weaver on the left, passing it over the warp your holding and under the succeeding warp. Let go of the warp you twined over and hold on the succeeding warp. Repeat the mantra until you are ready for the border and the "Spider" is almost finished. If an extremely long weaver is used, it will make a nice small "spider" with any splicing or inserting of weavers. When inserting a weaver, make sure the old weavers overlay the new weavers for 4 or more twinings before being trimmed or cut off or tucked in. To add a border to your "spider", make sure the weavers are long enough to complete another row or two of twining. If not insert a new weaver. The warps should be of uniform length. Cutting the ends to a point will help pushing them down between the weavers. Leave the first loop open, until the whole edge is complete. There are many borders to choose from, but for now learning one is enough, and give you a good idea how other borders are finished. Reading is a good resource, and have many creative finishing edges to pick from. And now you have a finished "Spider". Making 30 of these is good practice, and will help you remember beginning the base, and adding borders. Twining is the easy part, so in a spider there is less twining, and more learning how to start and end. Spider’s are also useful items when completed, and can be used as coffee mug coasters, small pendants, or two sewn together to form a small pouch, etc... have fun weaving. (C) 2017 Todd DeVries. All rights reserved. 6659 Dawson Street, Vancouver, BC, Canada V5S 2W2. Watermark theme. Powered by Blogger.